1Parts North America has named DENSO Products and Services Americas its 2018 Vendor of the Year. 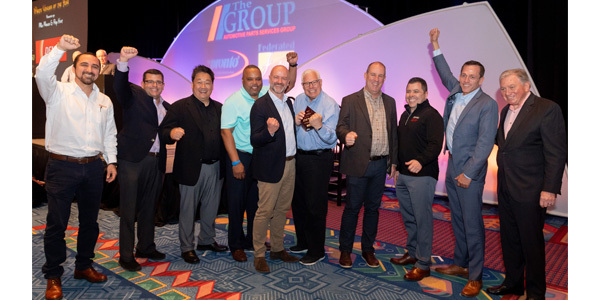 DENSO Products and Services Americas, an affiliate of DENSO Corp., received the coveted industry award during the Automotive Parts Services Group’s (The Group) national conference and expo in Lake Buena Vista, Florida. The Group’s Roy Kent and Mike Mohler and 1Parts CEO Alex Gelbcke presented the award to the DENSO team for its North American support of 1Parts partners Federated Auto Parts and the National Pronto Association. DENSO provided world-class customer service and went above and beyond to help Federated and National Pronto increase market share. The recent award marks the second consecutive year 1Parts has honored DENSO. At The Group’s inaugural conference and expo in 2018, DENSO was named 1Parts Vendor of the Year for support of the group’s North American membership.